I was paging through the latest Elle magazine, looking at one of the Trends pages, when I spotted a blouse with puffed sleeves. Elaborate blouses with ruffles, voluminous sleeves and other types of flounces are in this summer. The pictured blouse turned out to be from Zara, which has quite a few variations on these romantic looks. On the other hand, I think, “Where have I seen these before?” I paged through my copy of How to Read a Dress by Lydia Edwards, and sure enough, there were the sleeves, on dresses from the 1830s. But you just might see styles like this in the 1970s and 1980s sections of your favorite vintage store. Some of you might be old enough to recall Gunne Sax prom dresses from the late 1970s or Princess Diana’s leg-of-mutton sleeves on her gowns. The 1970s and 1980s witnessed revivals of Regency and Victorian styles of dresses and blouses. In fact, Victorian and Edwardian blouses and dresses were the first styles that were worn when wearing “vintage” was first becoming a trend in the late 1960s. Hip, edgy fashion-conscious youth would shop thrift stores and find original Victorian and Edwardian garments. I’m currently writing a book about vintage style, and one question I often encounter is “What kinds of vintage styles were in during the _______?” (Fill in the blank with the 1970s, 1980s, 1990s, etc.). Vintage style changes along with the looks that are currently on the runways. Vintage shops in the 1980s were often destinations for 1940s and 1950s looks, while the 1960s were more popular in the 1990s. Here’s the table I’ve been working on that summarizes what vintage looks were in when. Notice that I start each decade mid-decade rather than at the beginning. That’s because often a decade’s iconic style isn’t apparent until mid-decade, as this recent New York Times article shows when it declares – in 2017, mind you – that the style of the 2010s can finally be discerned as “covered” (i.e. modest dress). Anything that you’d add to this table summarizing what vintage styles were in for whom and from what influences? Maybe we can predict the next vintage trend…..
Picture a 1920s dress and hat, trying to imagine the style, fabric and color. What comes to mind as you picture the dress? Does it have a drop-waist? A hemline that stops just below the knee? Is it sleeveless? Is the skirt fitted, gathered or pleated? Does it have a straight hemline or an uneven one? Is the dress fabric you’re picturing rather light-colored (pastels?) and floaty, like silk chiffon? Or maybe black, adorned with beads or embroidery? How about the hat? Did you picture a round cloche? Was it a summer hat made of straw or raffia? Or a winter hat made of wool? Where did your image of the 1920s dress and hat come from? Did you draw from images from the film The Great Gatsby (and then, 1974 or the 2013 version?) or maybe the HBO series Boardwalk Empire? Did the dress and hat you imagined look anything like this? I’d like to have something to wear to a 1920s-themed event, like the Jazz Age Lawn Party or to a speakeasy bar. The pattern pictured above is a genuine 1921 pattern. The hat is a 1920s hat that I’ve had for years, displayed in my sewing room in a clear hat box. I’ve purchased linen fabric in the yellow-cream and light orange that matches the hat’s embroidery. I’ve been reading Heike Jenss’s book Fashioning Memory: Vintage Culture and Youth Style and it’s helped me understand why I’m questioning the “20s-ness” of my pattern. It turns out we have a selective cultural memory of what 1920s (or any past decade’s) style is. My 20s patterns doesn’t look 20s enough because I’m drawing off only the most iconic images of how that era has been reproduced in popular culture in films like Midnight in Paris or the television series Downtown Abbey. Costume designers regularly allow present styles to influence how they reproduce the past. So, for example, the 2013 version of The Great Gatsby features much more fitted versions of flapper dresses than actually was the style. It’s no surprise – every vintage store owner I’ve ever talked to about wearing 20s has told me that most women look terrible in the flat-chested, straight-sided, sack-like dresses of that era. But like most vintage enthusiasts, I’m highly influenced by the present in my imagining of what constitutes “the look” of the past. And so, just like a costume designer, I’m highly likely to alter the pattern’s style to give it a more shapely look that I can more easily wear in the present day. And then my altered “authentic” 20s dress will continue to shape how we today imagine the 1920s. Thus Juliette@ElusiveJ on Twitter so eloquently put it. I’ve been thinking about this quote all weekend, as I binge-listen to Purple Rain and favorite songs like “7” and “Raspberry Beret” (the kind you find in a secondhand store). I listen and remember how Prince and the 1980s Minneapolis scene rocked me through my young adulthood. I won the Purple Rain album at my high school senior prom. I remember dancing with abandon to “Let’s Go Crazy” in a peach-colored lace tea-length dress (a retro 1950s-style). When I saw the film Purple Rain (movies came later than soundtrack albums to rural North Dakota), I was fascinated with the urban scenes – First Avenue, Lake Minnetonka (actually, Cedar Lake playing the role of Lake Minnetonka), and the Crystal Court of IDS Center. When I arrived in Minneapolis in Fall 1985 for college, I was so excited to explore the city. I’d go dancing with friends at First Avenue. I’d scan the dark edges of the club, hoping to see Prince for the first 10 minutes I was there, and then I’d forget all about celebrity sighting. The multi-colored lights flashed, the beat pounded, and I would dance with friends, feeling like we were somewhere. The 1980s Minneapolis of my memory has a lavender glow. The neighborhood around First Avenue had more character then with its dive bars like Moby Dicks, or nearby Shinders with its comic books and enormous magazine section. We would visit the Chain of Lakes in the wee hours of the morning (usually Lake Calhoun), whispering and giggling, feeling transgressive. I would also go on urban explorations alone, walking in the early morning from Augsburg College in the Cedar Riverside neighborhood to Nicollet Mall in downtown. I walked along the Mississippi almost daily, and to the old Dinkytown (before it became a sea of student housing) on a weekly basis. I’d check out nearly every free concert and local festival. I learned how to be an independent, curious, confident young woman then, and part of what inspired my urban and personal exploration was the fantasy Minneapolis depicted in Purple Rain. The Minneapolis vintage scene has always been great, but in my memory it was a wonderland then. Just blocks from Augsburg was a funky store called Intermezzo with rubber duckies, vintage clothing, and odd apartment furnishings. Tatters opened a record shop and vintage store further down on Cedar. The Tatters location in Uptown was often graced by visits from his Purple Highness. The Ragstock Warehouse was a bit further away on Washington Avenue (when Washington was filled mostly with empty warehouses rather than today’s colossal condos). I’d rummage through barrels of clothes, pulling out satin pajamas, silk kimonos, 40s peplum jackets, old military uniforms, acrylic sweaters adorned with ribbons. Vintage was about trying on different characters for me then. I could be a 40s secretary, a 50s sock-hopper, a 60s go-go girl, a 70s bohemian. Did I want to be smart? Sweet? Assertive? Blase´? My wardrobe was eclectic to reflect my changing moods and identity experiments. I’ve been realizing this weekend that I haven’t been anywhere near as adventurous in exploring the city I live in as I was back then. And that situation needs to be rectified because life is too short to not appreciate what’s around you. Prince’s death has reminded me that it’s important to stoke that sense of wonder and curiosity. I’m sad our favorite hometown boy is gone and that I’ll never experience a Prince sighting. But I’m thankful that he put Minneapolis on the international map as a place where cool could happen and that he’s inspired me reconnect with that place and with my younger sense of self. March is almost upon us, and the hefty spring fashion magazines are out. As a vintage aficionado, I like to page through and see which vintage looks are making a comeback. While some looks are perpetually in style, such as 1960s shift dresses (see the latest from Kate Spade below), other revived looks don’t hang around for long. Vintage store owners also make a point of looking at the latest in the fashion mags and change their storefront looks accordingly. In Alligators, Old Mink and New Money, fashion-model-turned-vintage-store-owner Alison Houtte tells how she always made sure her Brooklyn store was stocked with the “latest” old versions of new looks. Why buy a fast-fashion reproduction if you can have the original look? The last time I was paying attention to fashion magazines looking at the “new” styles, I noticed the return of some 1970s looks that are not frequently revived. Will I be wearing my 1970s knee-length tapestry vest (a look that was all over stores this summer) or is it back to storage for this groovy vest? Paging through the March issue of Elle and Vogue, it appears the 1970s are still in. I’m particularly fascinated with this Gucci model from the Spring 2016 ads who appears to be channeling a young Elton John, minus the visible chest hair. And is this ad marking the return of the pageboy haircut? This spring 2016 suede cut-out dress by Bally also has an early 1970s look. From wide-leg trousers to the persistence of the maxi dress, it appears that the 1970s are still in. It makes me want to sell my house and purchase this fabulous 1970s Chicago apartment! Yeah baby! Like vintage? Say why for a chance to win gift certificates! I’ll continue with regular blog posts after Feb 15th. In the mean time, if you haven’t yet had a chance to complete my survey on why you wear vintage, then click on the link below and get started! If you complete a survey, you’ll be entered in a drawing to win 1 of 3 $30 etsy.com gift certificates, where you can find a huge selection of vintage clothing. You can find more info on the survey by clicking the link or by checking out my December 2015 blog post. Thanks and have a groovy day! Why do you wear & buy vintage? Hey vintage clothing wearers: Here’s an opportunity to win one of three $30 etsy.com gift certificates by answering this survey I’ve been working on. “Why a survey for those who wear vintage clothing?” you might ask. I have been researching vintage and secondhand clothing in some way for the last five years. I’ve interviewed vintage clothing store owners in the Twin Cities, and I’ve researched when wearing vintage first became a mainstream trend in the United States. Augsburg Now, the Augsburg College alumni magazine, recently interviewed me about my ongoing vintage clothing research, in case you’re curious. I’ve put together a survey for people who wear and/or buy vintage clothing. I’m hoping you would like to help out with this project. As an incentive to take the time to complete the survey, after the survey closes (on February 16th, 2016), I will conduct a drawing to choose three winners of $30 Etsy.com gift certificates. Just click on the link above to take the survey. And if you know other vintage clothing wearers – whether they wear it occasionally or all the time – please send them the link to this page. The more folks who share their thoughts, the better! Thank you – I really appreciate your help and look forward to hearing more about why you wear vintage! Update Dec. 18th: Thanks to those of you who let me know there was a glitch in the survey. I’ve fixed it. You can let me know at fischern@augsburg.edu if you encounter any other problems. Does this look too costume-y? 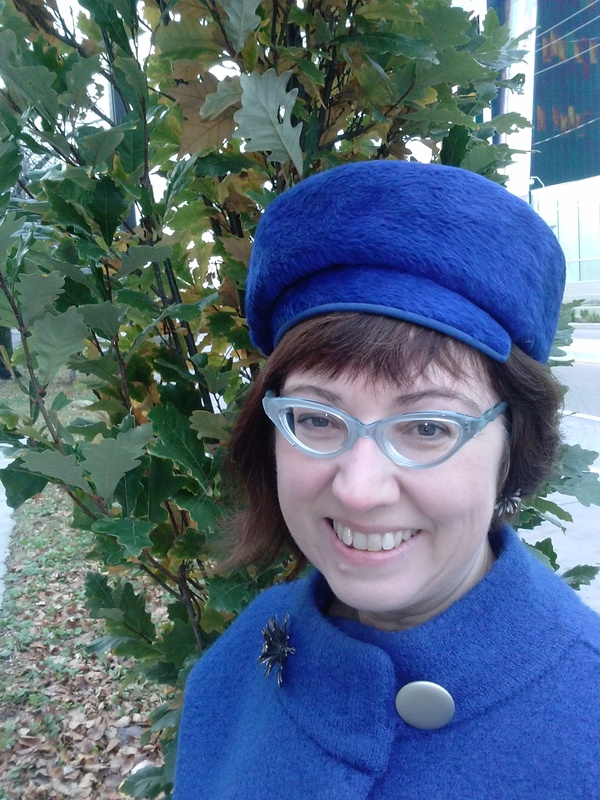 I’ve had my moments of vintage clothing buying when I want everything from the era for a certain look – the right 60s skirt, top, and then even hat, gloves and purse. But anyone who reads vintage styling tips knows, if you wear them all together, you run the risk of looking like you’re wearing a costume, rather than being stylish in the here and now. I can get away with a vintage skirt, and definitely a vintage purse, but a hat too? Definitely looking like I’m going to a theme party. That’s why I love Halloween. 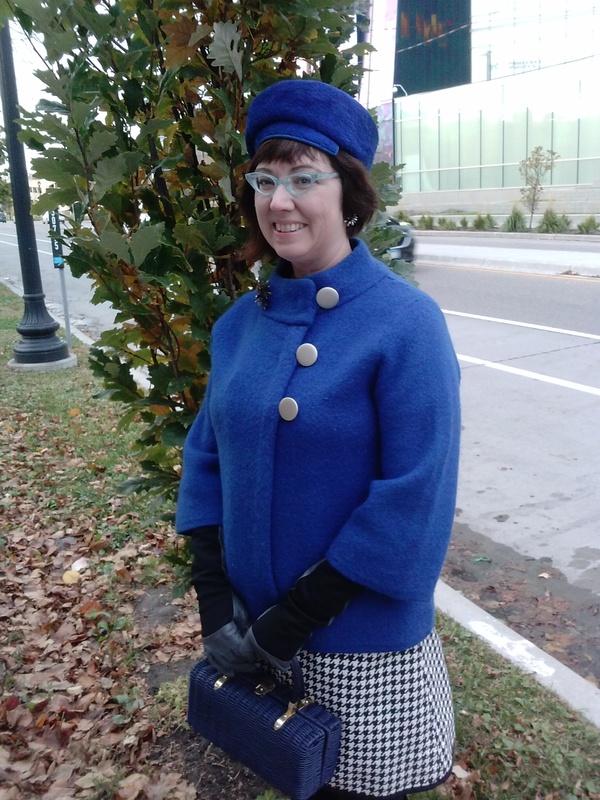 Other than having a Mod 60s Party to attend, it’s the one night of the year I can put together the whole look – hat, gloves, top, bottom, and purse – and get away with it. And it’s great fun to be out in public, wearing a 60s pillbox! People who find the look odd think I’m in costume, and those who like vintage dig seeing the whole look together. So vintage lovers, I hope you’ve taken advantage of Halloween as a chance to push the style boundaries a little and wear that entire Mad Men look tonight. Happy Halloween! Is that a Halloween costume or how she normally dresses?